Cal Poly continues to make progress on its goal of carbon neutrality by 2050. Total greenhouse gas emissions in 2017 were 17 percent below 2015 levels, and 20 percent below 1990 levels despite campus doubling in building square footage and on-campus residency since that time. Energy conservation efforts reduced 2016–17 building energy intensity by 3 percent over the prior year—23 percent lower than 10 years ago—while water conservation, zero waste efforts, and improved agricultural practices further reduced carbon emissions. Along with greater renewable energy generation across the state from solar and wind, increased rainfall in the northwest improved hydroelectric generation for PG&E in 2017, resulting in 79 percent of Cal Poly’s electricity purchase coming from carbon-free sources—up from 59 percent two years ago. 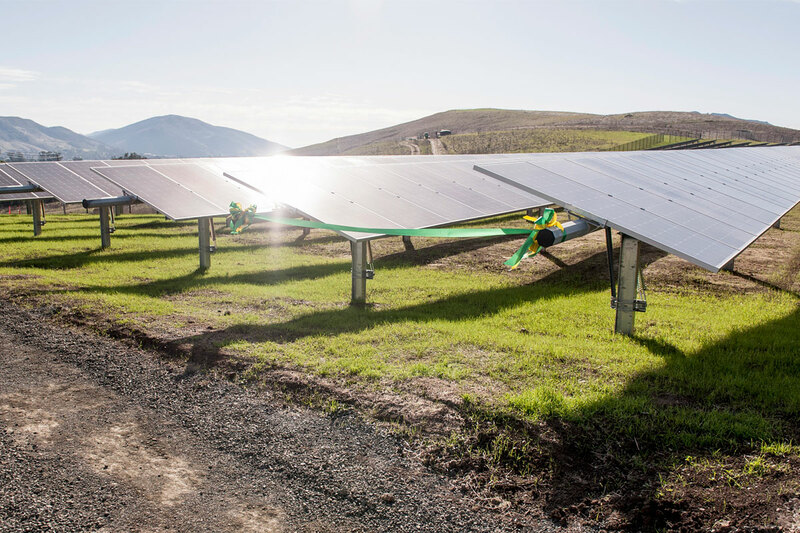 With completion of the 4.5 MW Gold Tree Solar Farm in May of 2018, 25 percent of Cal Poly’s total electricity needs are now being met by on-site solar generation, with more solar projects in development.